The most abundant substance on earth, water can the best friend of a person with back pain, especially when certain exercises are too painful to perform on dry land. The natural buoyancy of H2O also allows your spine-supporting structures to be more flexible so you can safely target important core muscle groups. There are many forms of water exercise that can be good for back pain. Here are five of them. Back pain can occur while you’re recovering from a medical procedure, such as an alternative to spinal fusion surgery. Santa Monica patients should be sure to consult their spine specialists before attempting to do any exercises on their own. Work your core spine-supporting muscles a bit more by slowly bringing one leg up as you walk in water. Try to touch it to your chest, then switch legs and do the same thing. You may be surprised at how easy this movement is when done in water. If you’re worried about your balance, make the same movement while holding on to the side of the pool. Once you feel more comfortable, do knee-to-chest stretches as you walk from one side of the pool to the other. • Backstroke hug – Hold on to the kickboard while on your back as you do a backstroke without arm movements while kicking your legs. Lap swimming can be a great way to target all your spine-supporting muscles. Just remember to pay attention to proper form. If you’re new to lap swimming or you’re having difficulty because of existing back pain, start with the backstroke or breaststroke. These movements don’t require as much excessive spinal extension. 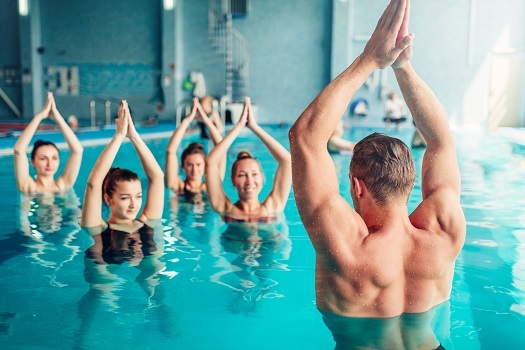 Water therapy that involves exercises like the ones discussed here shouldn’t be the only thing you do to manage your back pain. Talk to your doctor or Santa Monica spine surgeon about a well-rounded treatment plan that includes appropriate medication, forms of physical therapy you can safely do when not in the water, and positive changes you can make in your diet and posture habits. If you’re experiencing sudden, severe, or prolonged pain in your back, see a spine surgeon right away for prompt diagnosis and treatment. The spinal health specialists at The Spine Institute are industry pioneers in treating every form of back pain. Call one of our friendly representatives today at 310-828-7757 to schedule an appointment.